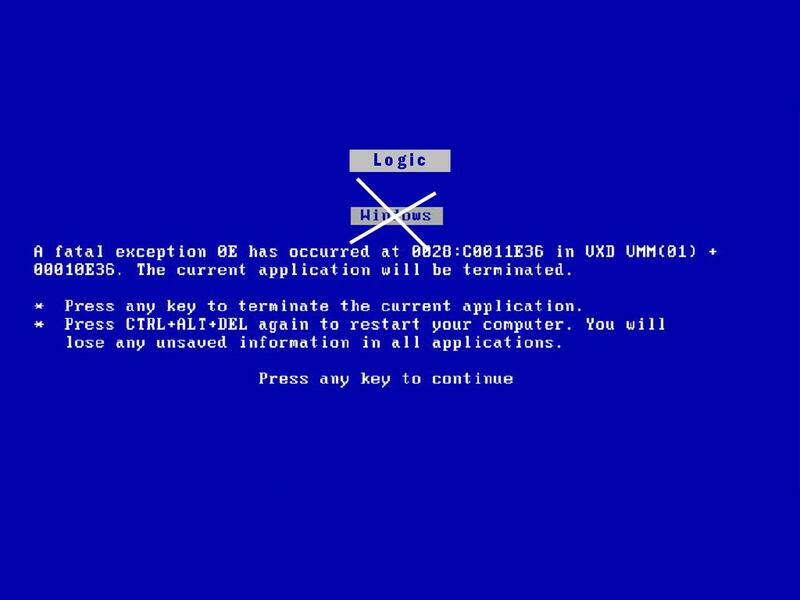 The Windows “Blue Screen of Death” is infamous in the world of IT for its severe, and distressing psychological effects on users. These include symptoms such as head-banging, hair-pulling, extreme frustration, high stress, fits of rage, screaming etc, and has even been known to make grown men cry.
. . . This post is not about that. . . In fact, as much as I’d like to bash Windows for its instability and tendency to crash, ultimately this has little to do with computers or operating systems at all. This post is a summary of my thoughts on lines of reasoning which cause theological crashes if such things exist. A better name for them might be logic’s limitations. “Why then, the strange introductory paragraph?” you may be asking. Well – computers illustrate what I am trying to say quite well. Well, unfortunately, I am no closer to being able to explain the answer to those questions than I was five years ago, except that perhaps God has transformed my mind a little further to help me understand and accept these concepts myself. I personally believe that questions like these ARE unanswerable on this side of eternity. You can speculate all you like, but after all is said and done, we simply cannot identify with something which has no beginning and no end. Or no creator for that matter. We run on a system of reason called logic. Logic can be inductive or deductive. It is extremely powerful, but has its limitations. Just like an operating system, it works on certain rules. Just like a windows machine cannot “comprehend” a linux programme, or a cd player cannot “comprehend a dvd in its tray, so our finite minds, working with the rules of logic are not created with the ability to comprehend all things. We know, that logically – everything has a beginning and an end, and that nothing can be both three things and yet one thing at once, and that nothing cannot have been created, nor can a person be in more than one place at one time! Yet, the Bible claims all these things, and as the Bible is the inspired Word of God who cannot lie, they must be true. So, yes, though the answers to the above-mentioned theological questions may be elusive this side of heaven, isn’t it wonderful to think about our resurrected bodies which will be capable of infinitely more than they are now! This means a mind which can comprehend mysteries such as these! But for now – next time someone asks me a “blue screen” question, I will be able to calmly reply that though it may be fascinating to contemplate the possible answers, our system of logic is finite, and must be ‘upgraded’ in order to wrap our minds around concepts which make us crash at present. Dont get me wrong – logic can be an incredible tool for understanding the Bible. Christianity, more so than anything else can be based on hard evidence, facts and sound reason. There is more than enough to convince us of its authenticity, but thats not where it ends, God requires faith in His wisdom. So, I havent answered these difficult questions, because I don’t think they’re answerable, but I have shown you why, I believe, this is so. I thank God for faith to trust His perfect reason where mine fails so miserably!